Summer has come and gone, the kiddo is back in school, and it’s time to dust off the ol’ blog. I had every intention of writing in June. And July. And August. But let’s face it: Summer in Maine is fleeting. Living three miles from the ocean is distracting. Having a tween who may decide at any moment that I’m entirely uncool is motivating. Instead of working, we adventured. 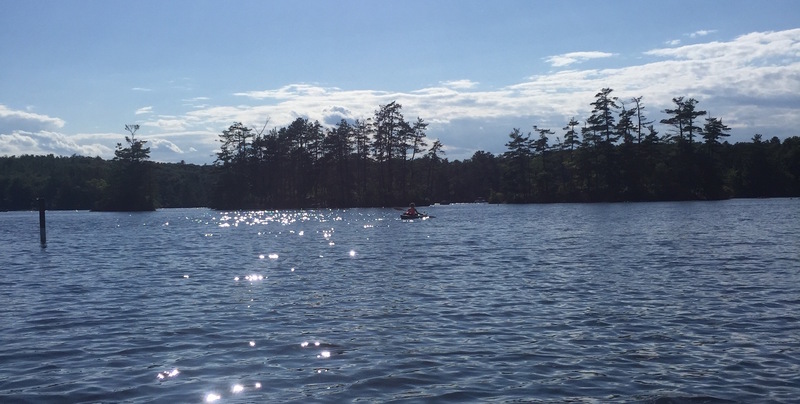 First up, a mom and daughter camping trip to Pawtuckaway Lake State Park in New Hampshire. Ambitious but not unrealistic, I reasoned. My parents took me camping all the time when I was a kid. I had plenty of experience sleeping in the woods and enough equipment—with a few borrowed items—to make it comfortable. So I booked a site right on the lake for one night. I packed a tent. An air mattress. Sleeping bags, pillows, a lantern. A single burner with a mini propane tank to heat soup. Bug spray. Snacks. More snacks. We loaded a borrowed kayak onto the roof and jam-packed the car. All family members (except me) were convinced I had bitten off more than I could chew. But I was determined, and so was my daughter. We were going to prove them all wrong. In Epping, we stopped at a Wal-Mart to buy a playak for Em. We picked up more snacks. I bought a pocketknife. Because, bears. When we arrived at the campground registration building, a young boy gave Em his walking stick. He was finished with it, but it was “the best walking stick, ever.” Em graciously accepted the gift, but left it leaning against a tree a few minutes later. She’d find her own best walking stick, ever, she told me. We drove along the shaded dirt road toward our site, Em consulting the official campground map and calling out directions from the back seat. It was a beautiful sunny day. Light came through the leaves and made shifting patterns on the ground, and the air was warm but not sticky. Summer at its best. Perfect weather for camping. The minute she hopped out of the car and saw the lake, Em wanted to swim and kayak. With just an inkling of anxiety about our unpitched tent, I agreed. We kayaked out onto the lake. We stopped at islands, swam, played ball on the beach, found a playground. When Em got tired of paddling, I tethered her to the back of my kayak and pulled her along. We held hands and jumped off a boulder into the water. She watched me arrange the logs and light some dried leaves beneath them. It caught quickly (thank God) and we turned our attention to the propane burner. I clicked on the gas and lit the pilot. As I pulled the tent out its bag, it occurred to me that for all the camping trips I’ve been on, I’ve never been much of a participant in the site set up. Filling the water jug? Sure. Collecting sticks? On it. Marshmallow roasting? I’m your girl. I got a whiff of smoke and glanced at the fire, now a smoldering pile of wood. My eyes went back to the lump of tent and stakes on the ground, the deflated mattress still in its bag, the cold propane burner. The setting sun. The look of worry on Em’s face and the question forming in her mind: Does mommy have any idea what she’s doing? “Should we call someone?” she asked. The lantern came out. The bug spray went on. The mattress got plugged into the car outlet. Em snapped the stakes together. I found instructions for tent-pitching stitched to the side of the bag (because LL Bean knows about people like me). The tent went up, slightly lopsided but at that point it hardly mattered, and we loaded in the mattress. I will admit I texted a friend for fire-starting tips: Make a teepee, find some little sticks, add pine needles, blow on it. Boom! Inferno. Yes, we ate cheese and crackers for dinner. We also had perfect coals for s’mores by the time we were done. Yes, Em ended up sleeping in the back of the car with my phone on the Bed Time Fan app because my city kid didn’t like the silence of the woods. And, okay, I did have to call AAA to jump the car battery, which was spent on mattress inflation, device charges, and interior lights left on too long. The site we were on wasn’t available… but there was another site that was. So we packed the car, drove down the dirt road, and set up all over again. I returned the unopened knife to Wal-Mart on the way home. Bears are no match for Em and me in the woods.